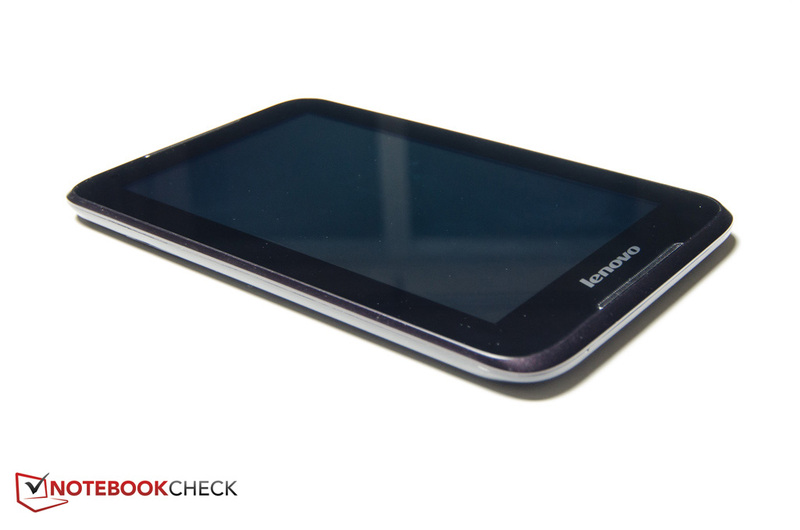 Chinese manufacturer Lenovo is no stranger to tablets. While the higher-end ThinkPad Tablet 2 and ThinkPad Helix feature Windows 8, sport Intel hardware, and are aimed at business professionals, the low-cost IdeaTab A1000 comes with Android OS and covers the opposite end of the price spectrum. With many excellent offerings from other manufacturers around $200 in the Android tablet-space - see our review of the second-generation Google Nexus 7 as an example - Lenovo obviously had to cut some corners to compete predominantly on price. The 1024 x 600 resolution display is definitely a distinguishing factor, unfortunately in a negative sense, as most newer competitors offer at least HD resolution. 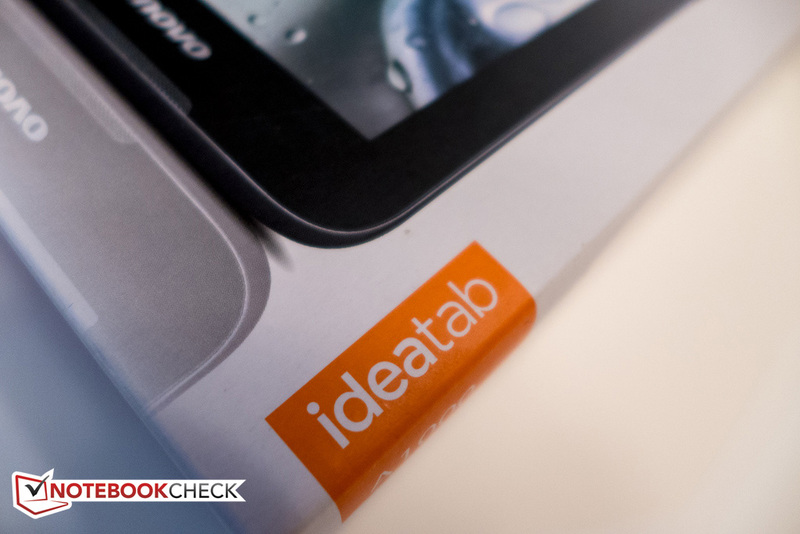 Can the IdeaTab A1000-F, which currently costs $150 directly from Lenovo, hold its own against the likes of Google Nexus 7, Amazon Kindle Fire HD, or Asus MeMo Pad HD 7 despite the entry-level hardware? 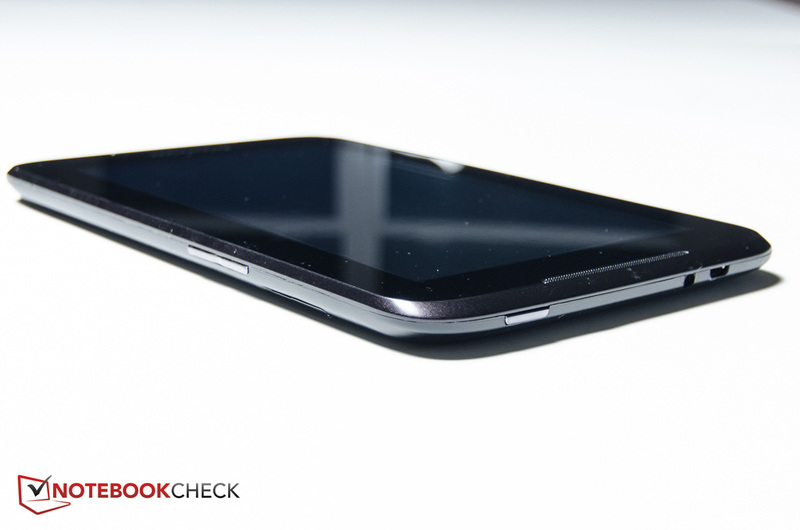 For an affordable tablet, the chassis is actually surprisingly solid. Although a bit larger and over 15 % heavier than the also very inexpensive Asus MeMo Pad HD 7 - the A1000-F measures 198 x 122 x 10.2 mm and weighs 352 g - the nicely rounded case is resilient to twisting and the curved back hardly has any give when pressure is applied. The back is matte black and slightly rough, which gives the fingers something to hold on to and the tablet fits nicely into the hand. 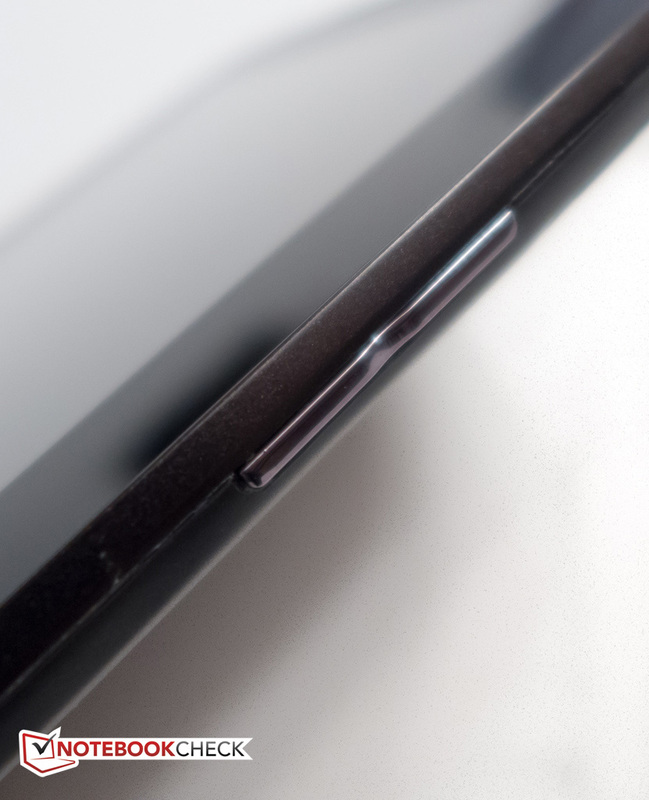 The tablet can't deny it's budget roots: the materials used are not very upscale and we did notice a sharper edge around the perimeter in the transition area between the bottom and the top half, which is where the thumb comes to rest when holding the tablet. 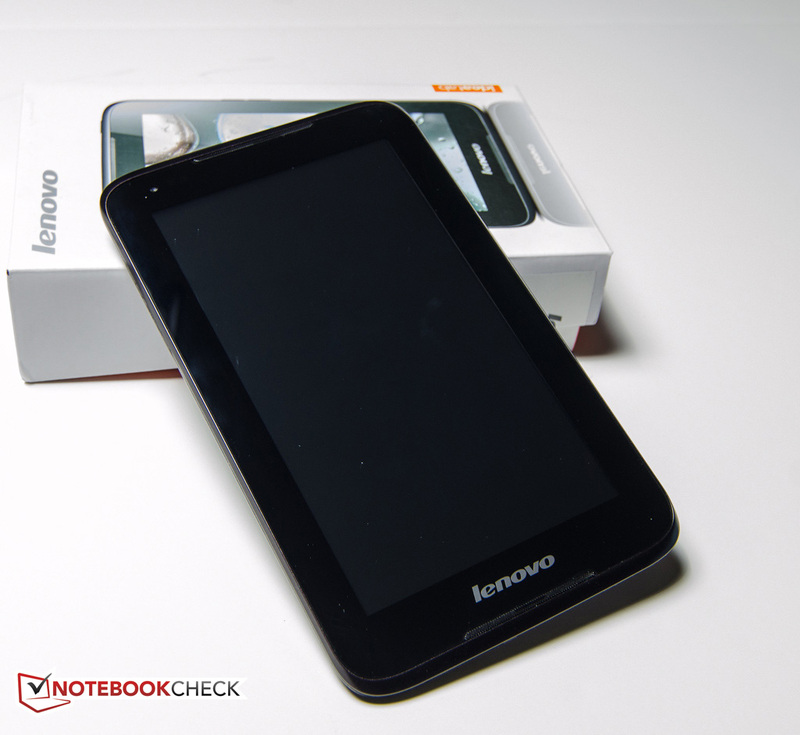 The glossy screen and the back both are susceptible to finger prints and the user should keep a cleaning cloth handy. 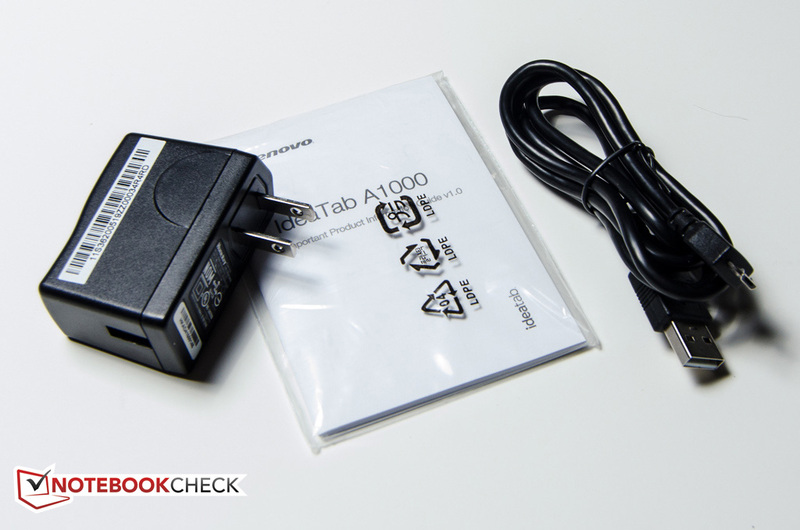 The IdeaPad A1000 doesn't offer a lot of surprises as far as connectivity options are concerned. 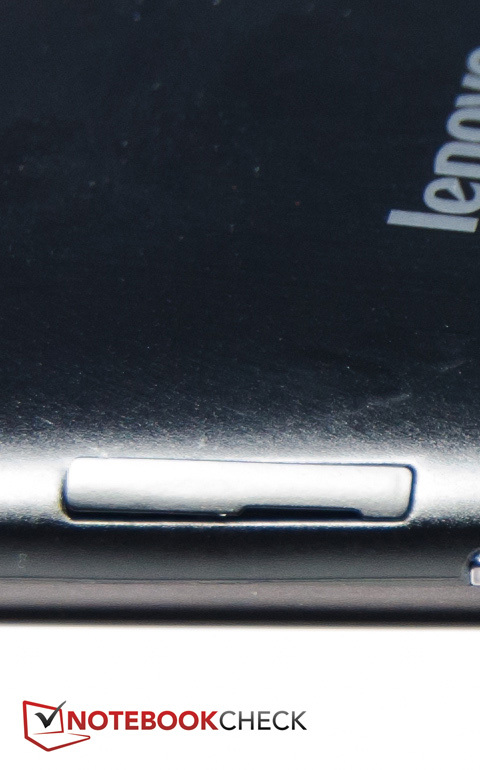 Around its edges, there's the power button next to the 3.5 mm headphone jack, a volume rocker switch, a micro USB port, and a little plastic flap covering the microSD card slot on the right. 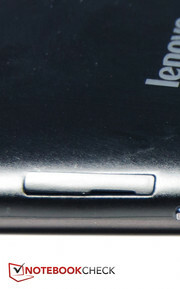 Interestingly enough, the tablet also has the same flap on the left side - but there is no actual spot for a card. Presumably this is a SIM-card slot to support telephony in other markets - but the US model needs to make due without this option. We ran into issues trying to get the slot cover back into position after pulling it up, as it requires lifting the opposite site so it goes back in just at the right angle. 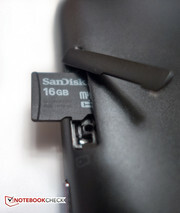 The micro USB port supports USB On The Go (OTG), although a suitable adapter cable is not included. Given the price point, we are not too concerned about the omission of a dedicated video-out port (micro HDMI), even though it would certainly be a nice-to-have feature. 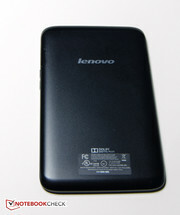 Lenovo uses a largely unmodified Android v4.1.2 Jelly Bean OS. 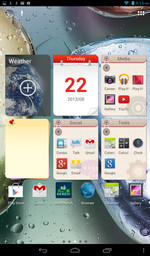 In addition to a few custom widgets, the home screen features several customizable folders, prelabeled "Media", "Social", and "Tools". Unfortunately, the icons in the content folders are not clickable directly even though they are certainly large enough for that purpose - the folder has to be opened first. We found it easier to just place regular shortcuts on the home screen instead and to use left and right swipes to access less frequently used icons. Other modification include an entry for the "Dolby Digital Plus" equalizer software - which is only available when headphones are plugged in - and a "Scheduled power on & off" in the settings menu. While the latter works like intended, we have no idea what this feature could be useful for. Communication capabilities are equally unimpressive. The WLAN b/g/n module from Broadcom only supports the 2.4 GHz band but works well without any drops - although the signal strength could certainly be better according to our unscientific distance tests. Bluetooth 4.0 is also part of the package and we were able to connect both a Bluetooth keyboard and mouse without any issues. 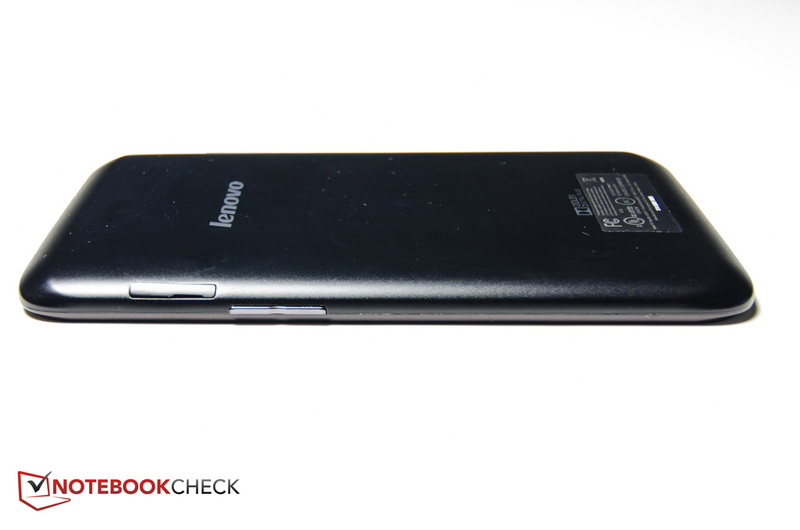 The GPS sensor never established a satellite lock inside - even though an old Samsung Galaxy Tab 8.9 had no problems. When we took the tablet outside, it still took several minutes before we had a reliable lock - in one case, the tablet only discovered a single satellite where it found six previously. The colorful box only contains the tablet, the power adapter, the USB cable, and a short product information guide. In the US, Lenovo offers a 12-month warranty against defects. For an additional $59, the base warranty can be extended to a 24-month mail-in warranty. 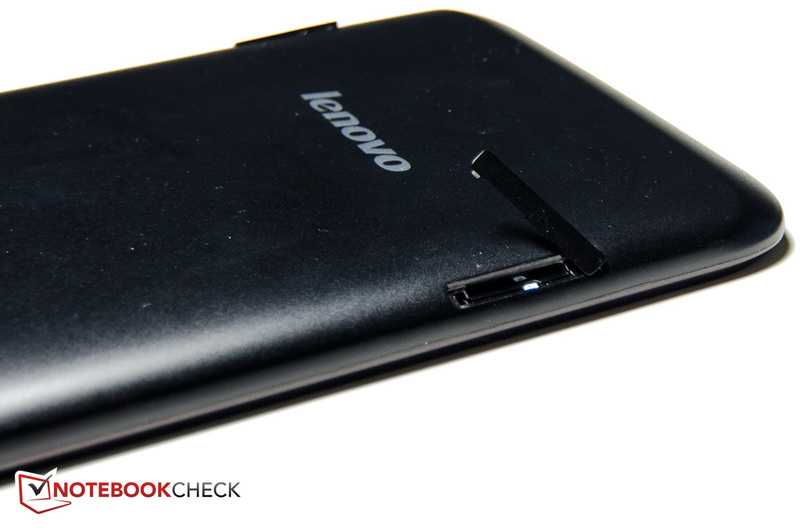 Unlike many competing tablets, the A1000-F does not include a rear-facing camera. The front-facing camera at the top left corner of the bezel only offers 0.3 MP resolution and is suitable for occasional video conferencing at best. 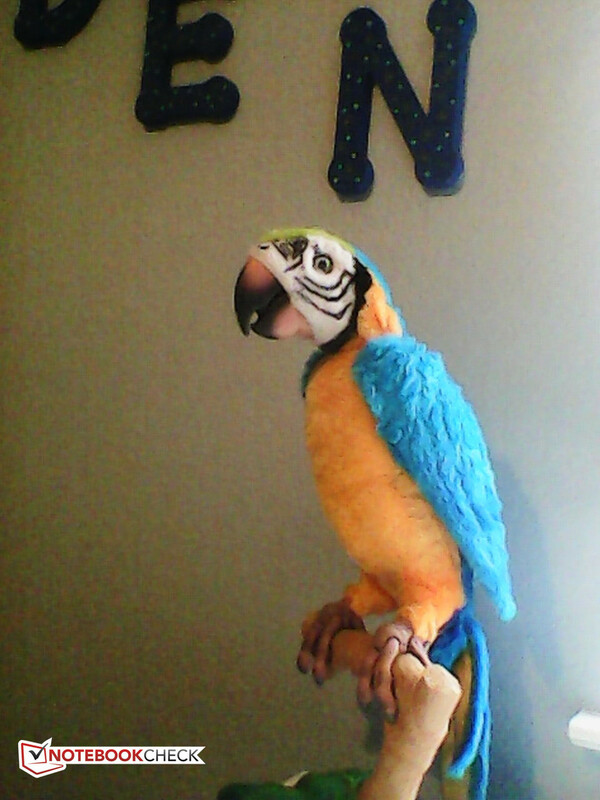 Indoors and under less than ideal lighting conditions, snapshots exhibit a lot of color noise and lack sharpness. 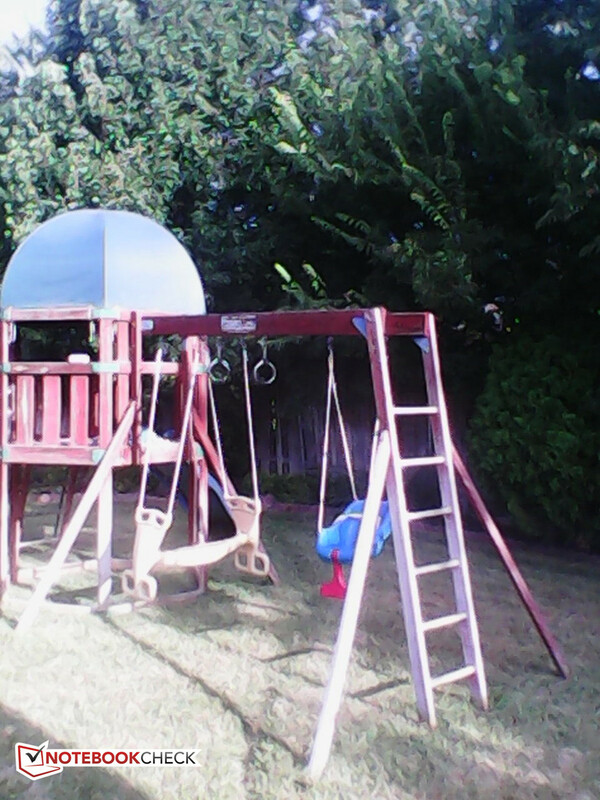 Photos taken outside in direct sunlight are pretty much unusable since the colors are way off. Videos don't look very impressive on the 1024 x 600 pixel display, since not even 720p is supported natively. 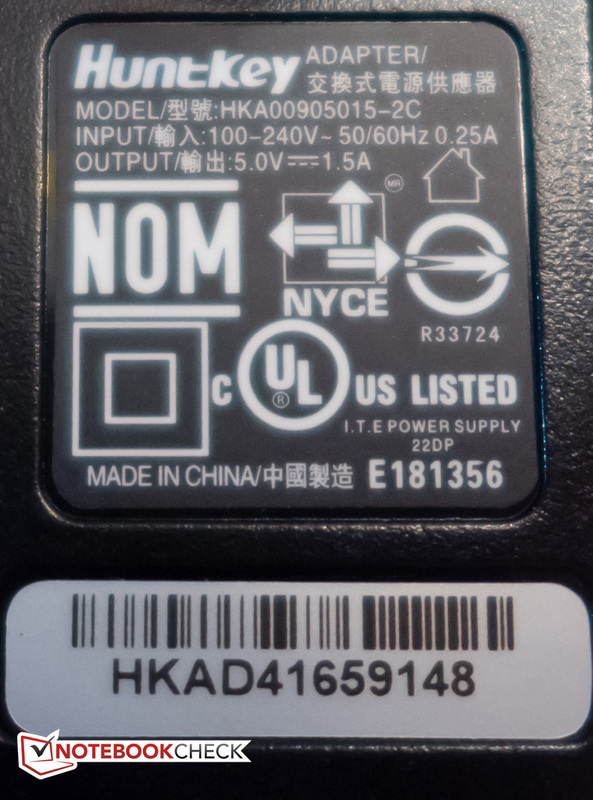 The overall quality of the display itself - see the "Display" section below - does its part to make watching movies a not-so enjoyable experience. The video player supportes .mp4 and .mkv; for other file formats, a suitable player has to be downloaded from the Play store. We downloaded two 720p h.264-encoded trailers with a bitrate of 6 mbps to check the playback quality. The .mp4 version played without any issues, but the .mkv file did not run smoothly at all, although other ones we downloaded did. YouTube videos run smoothly, although we noticed some occasional stutters when streaming 1080p material. The capacitive touchscreen, which recognizes up to 5 fingers simultaneously, works well and recognizes inputs reliably, no matter if they are scrolls, zooms, or simple clicks. 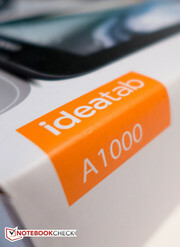 The IdeaTab A1000-F comes with the standard Android virtual keyboard. 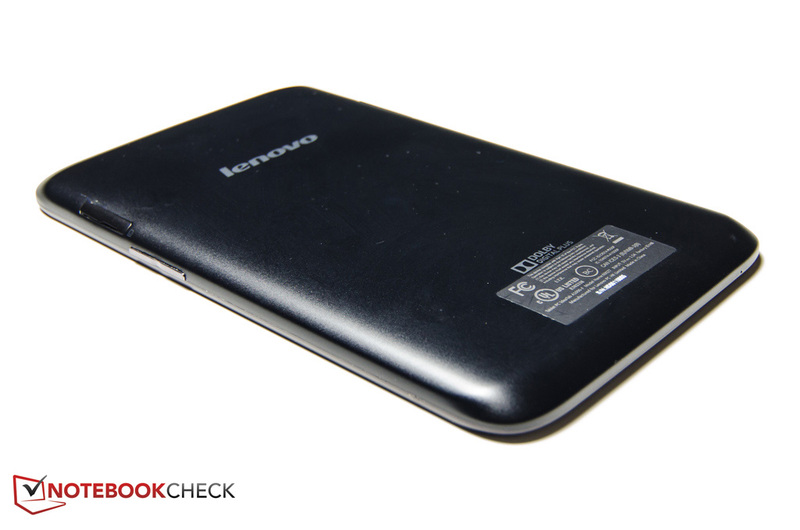 Lenovo not only provides audible feedback in form of typewriter sounds, but haptic feedback via a pager motor. No other layouts are offered, but of course additional keyboards can be downloaded from the Google Play store. 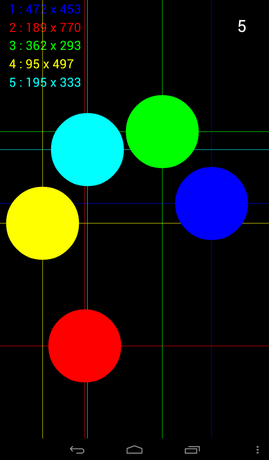 The automatic screen rotation works reliably, but with a pretty significant delay of over one second at all times. The bottom area of the screen contains a narrow band with the three Android control buttons "Back", "Home", and "Tabs". While most other fairly inexpensive tablets like the Asus MeMo Pad HD 7 and even the previous-generation Nexus 7 offer a resolution of 1280 x 800 pixels and IPS displays, the Lenovo IdeaTab A1000-F has to make due with a TN panel and a paltry 1024 x 600 pixel resolution. 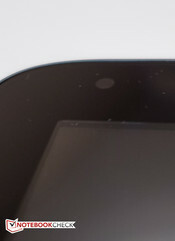 The dot pitch of about 170 PPI is just about half of the new Nexus 7 with its 1920 x 1200 resolution display. Small text looks quite pixelated and can be hard to read, so we had to zoom in on multiple occasions. The display is very bright though - over 400 nits on average outperform both the Asus MeMoPad and the considerably more expensive iPad Mini, which achieved 340 cd/m² according to our measurements. The backlight uniformity is quite decent at 88% and the contrast ratio of 660:1 allows for sufficiently dark blacks. 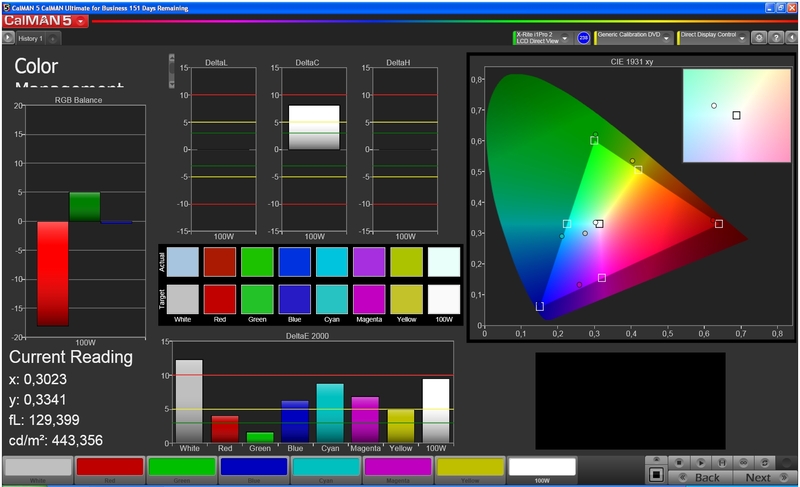 Editor's note: The display of a separate but otherwise identical U.S. A1000 model returned the same black level results as the European model but with a lower maximum screen brightness of 368 nits on the center of the screen. 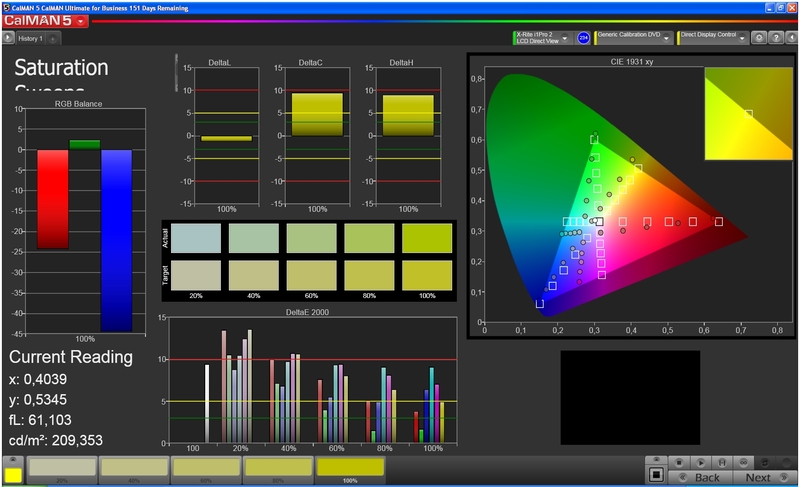 The backlight intensity or panel type may differ between regions. 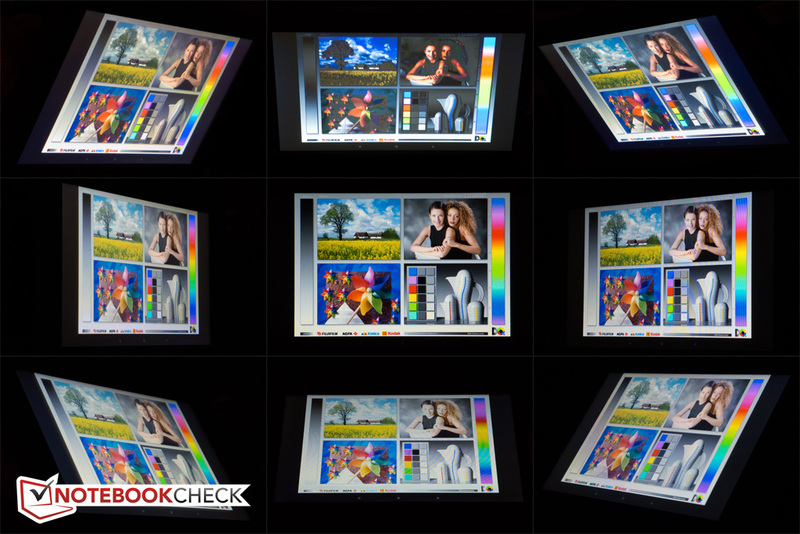 At over 11000K, the color temperature of the display is very cool and significantly above the ideal of 6500K. Neither the color nor grayscale accuracy are very good at a deltaE deviations of about 8 and 10, respectively. 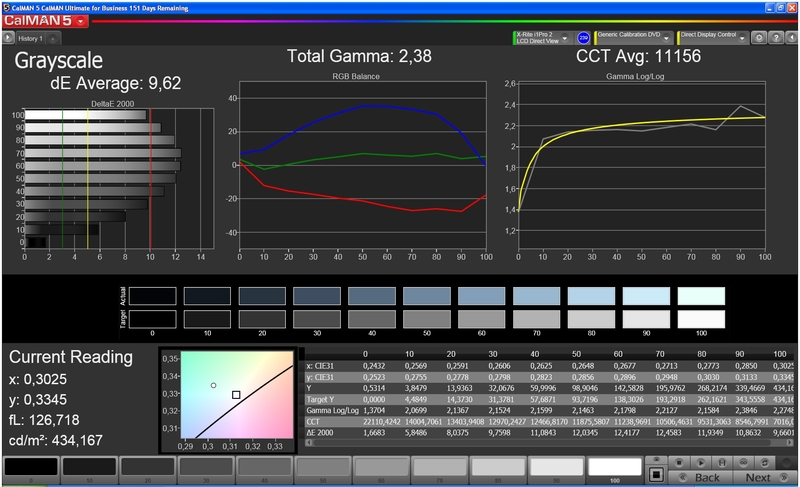 Although the total gamma value is not too far off, reds are too weak, which in turn gives the display a noticeable bluish cast. Subjectively, the colors are not very vivid. Because of the good brightness level and decent contrast, the IdeaTab A1000 can be used outside without major reservations. 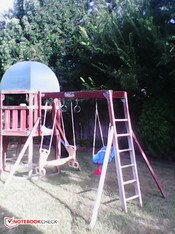 As always with glare-type screens, it's much easier to work in the shade than it is trying to decipher the screen in the sunlight - especially considering that small text is not overly sharp in the first place and frequent zooming will be required. Some issues with the viewing angle stability also make it necessary to change the orientation of the tablet at times to prevent the picture from fading. Since the glossy screen is very susceptible to finger prints, it pays to keep a cleaning cloth handy. Viewing angle stability is a very mixed bag. As expected, the TN panel is far less stable than a display with IPS technology would be - but in addition, it matters greatly in which direction the tablet is tilted. When in portrait mode, just a slight rotation of the tablet in a clockwise direction leads to a rapid darkening of the screen and the display content becomes unreadable. In the opposite direction, there are no issues. 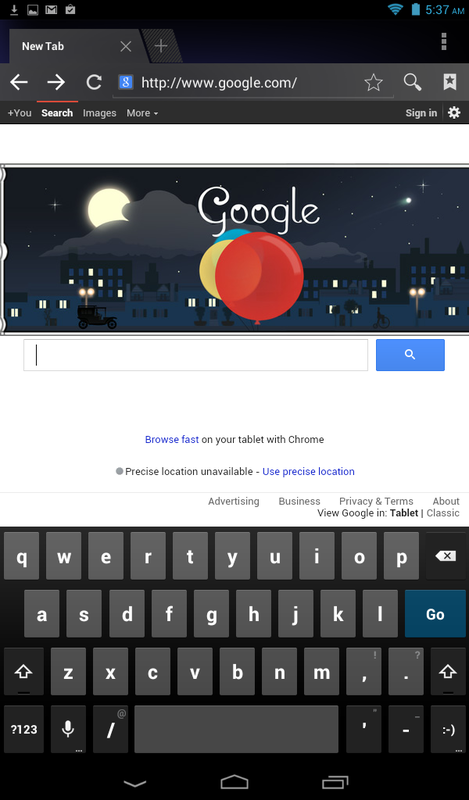 Of course, in landscape mode, the screen darkens when viewed from above when the power button is facing to the left. 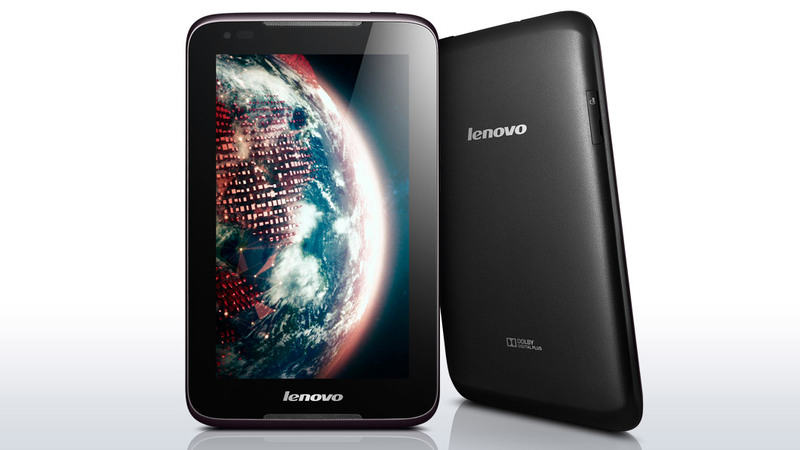 Lenovo uses the MT8317T dual-core processor from Mediatek. The SoC is based on the Cortex-A9 architecture and incorporates a PowerVR SGX531 GPU. The entry-level SoC features a clock speed of 1.2 GHz and addresses 1 GB of LP-DDR2 RAM. 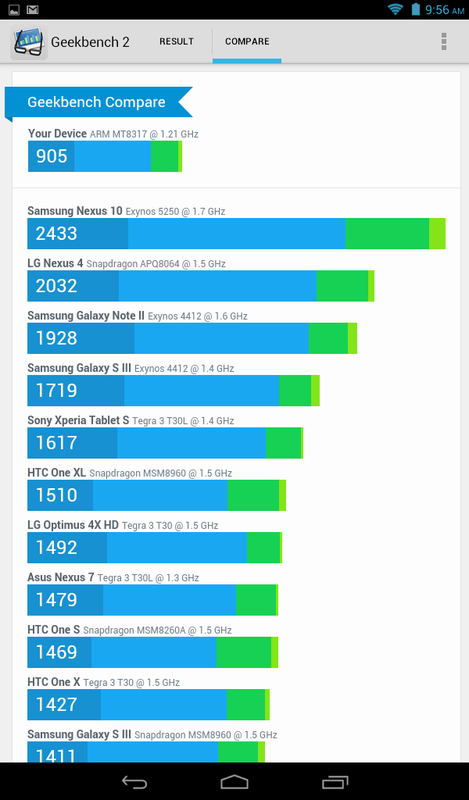 The IdeaPad A1000 completed the Geekbench 32 benchmark test with about 900 points and trailed the inexpensive Asus MeMoPad HD 7 with its quad-core MediaTek MT8125 by over 30 % and the new Google Nexus 7, which is equipped with a Snapdragon S4 Pro APQ8064, by almost 45 %. Overall performance is generally a bit sluggish and lags behind the competitors. Compared to recent tablets we have reviewed, opening programs, multitasking, and navigating takes a little longer. 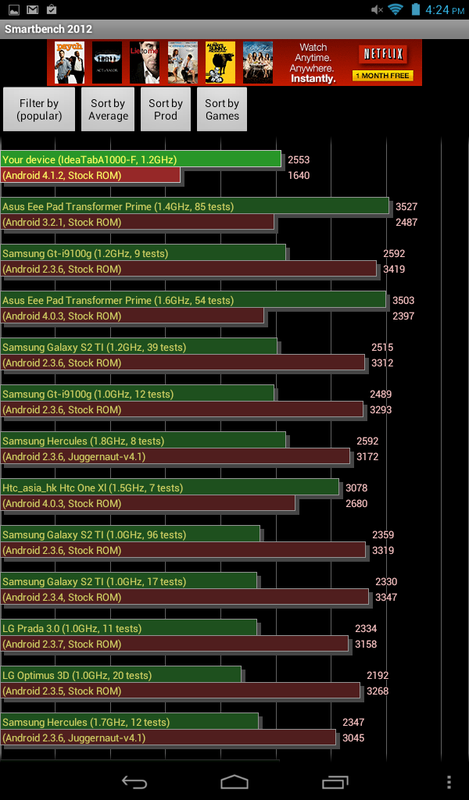 The browser benchmarks paint a different picture, as the performance of the A1000 in this area is in line with other tablets like the Samsung Galaxy Tab 3 7.0 and the Amazon Kindle Fire HD 7. 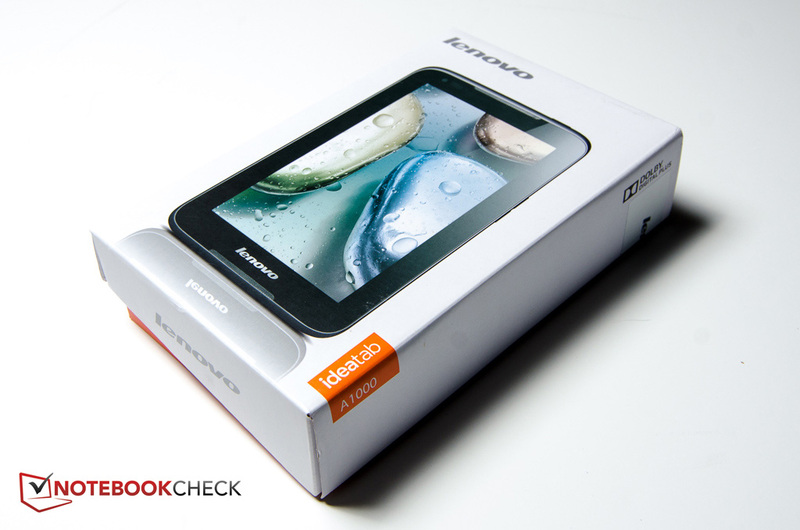 According to the tool AndroBench3, the 16 GB eMMC module Lenovo uses offers 25 - 40 % less performance during sequential reads than the flash installed in the Samsung Galaxy Tab 3 7.0 inch or the Amazon Kindle Fire HD 7. 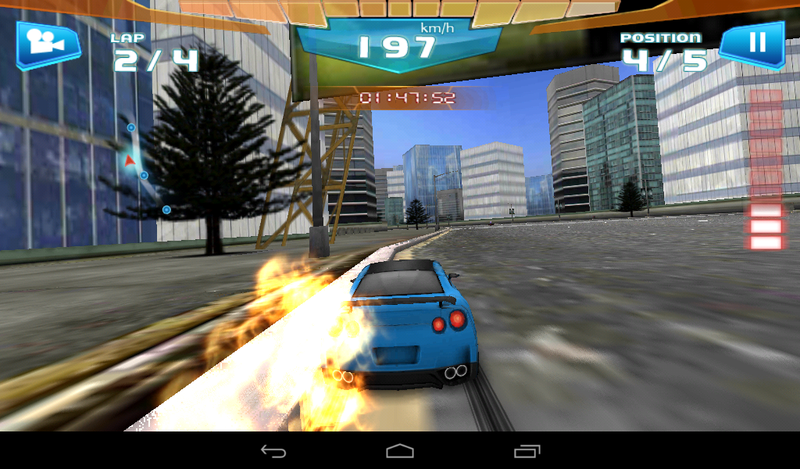 The new Nexus 7 is about twice as fast during the same test. One design aspect left us scratching our heads: for some reason, Lenovo decided to partition the 16 GB of storage into into 1.5 GB of "internal storage", while the rest is designated as "USB storage". 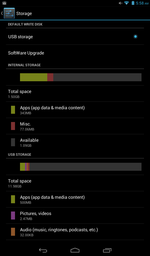 Since the internal storage is were Android apps and data are stored, it's entirely possible to run out of room with just a few downloads and updates. 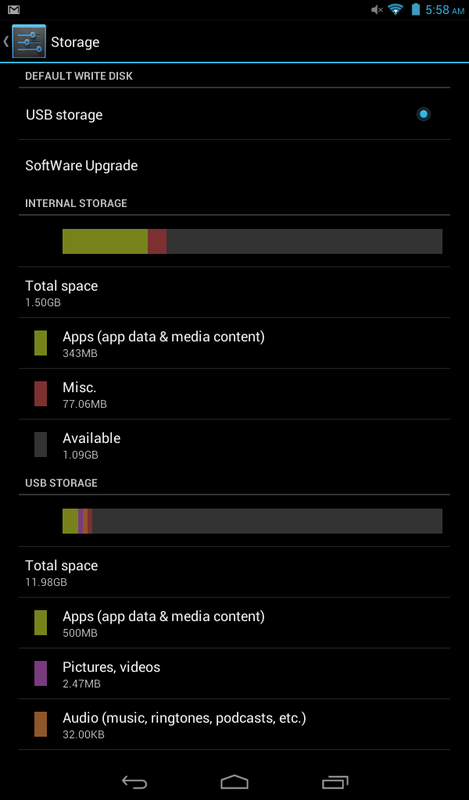 While it's possible to use the "move to USB storage" function in the info screen of each application, the process is tedious, doesn't work with all apps, and will still use some of the internal storage regardless. The entry-level MT8317T dual-core processor from Mediatek makes use of a PowerVR SGX531 GPU from Imagination. Although the synthetic benchmark tests show the GPU to have very modest performance - Epic Citadel in high quality only ran at 28.4 fps compared to 52.4 fps for the MeMoPad HD 7 with the PowerVR SGX544 - we didn't have major issues in our gaming tests. Most titles we tried ran smoothly. The viewing angle issue we mentioned earlier does impact tilt games, as the TN panel has to be held perfectly to avoid significant dimming. Temperatures are very well controlled. During idle, the tablet reaches a maximum of around 32 °C. During the stress test, we recorded a high of around 39 °C and an average of about 34 °C - neither of which are a reason for concern. We were never uncomfortable holding the tablet in our hands when performing more demanding tasks like playing games. (±) The average temperature for the upper side under maximal load is 34.4 °C / 94 F, compared to the average of 30.7 °C / 87 F for the devices in the class Tablet. (±) The maximum temperature on the upper side is 41.2 °C / 106 F, compared to the average of 34.8 °C / 95 F, ranging from 22.2 to 51.8 °C for the class Tablet. 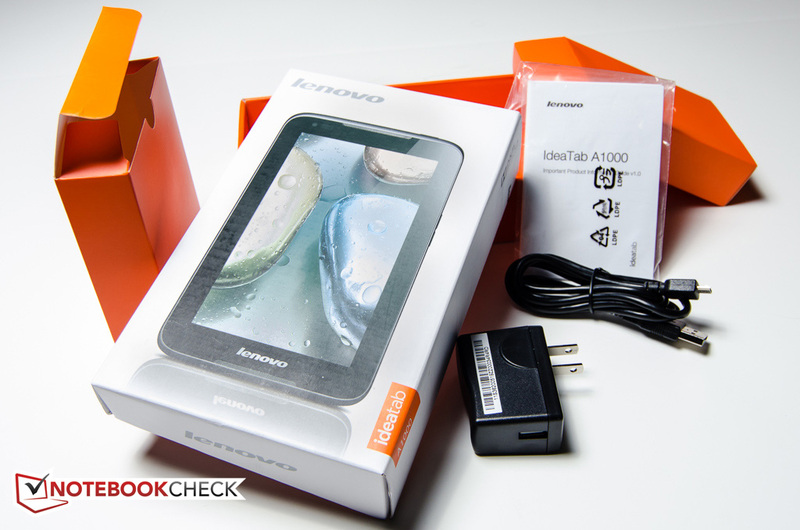 Lenovo incorporates two front-facing speakers into the IdeaTab A1000. The sound quality is decent and although the bass is lacking, mids are well-represented and the highs are not overly harsh. The speakers also get quite loud, although there is noticeable distortion at high volume levels. The Dolby Digital Plus equalizer software only works when the headphones are plugged in. 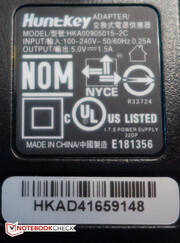 The internal lithium-ion polymer battery has a capacity of 3500 mAh and provides 13 Wh. 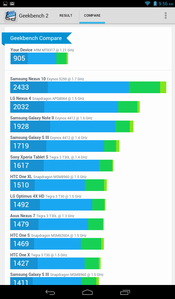 The battery life of our review candidate is roughly in line with other tablets in some areas, but not in others. For the maximum battery life (minimum brightness, wireless turned off) we recorded just about 12 hours - the Google Nexus lasted an incredible 44 hours here. For our more realistic WLAN test, we set the display brightness to about 150 nits and loop a script to simulate typical browsing conditions. Under these circumstances, the A1000 lasted a very decent 9 hours before we had to plug it back in. 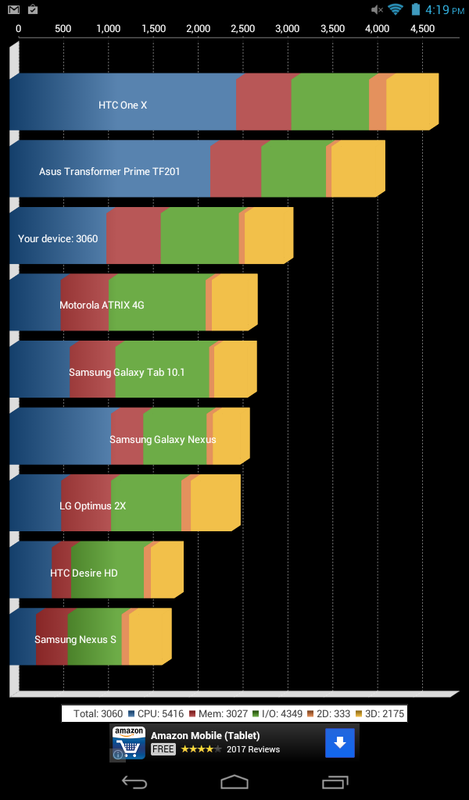 The admittedly much more powerful new Google Nexus 7 lasted almost 7 hours, the Asus MeMoPad HD 7 7 hours 45 minutes. Under full load, the IdeaTab A1000 shut down after only 2 hours and 58 minutes. 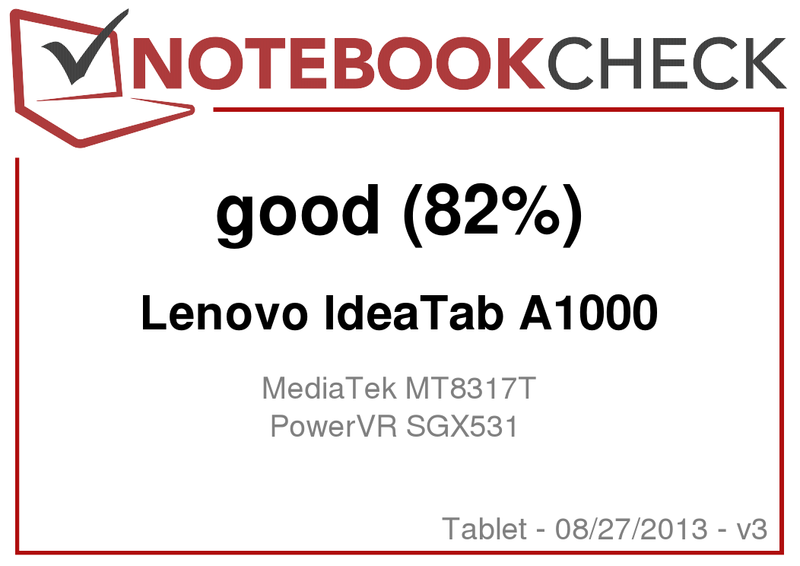 There is no question that the Lenovo IdeaTab A1000 is a decently built and affordable tablet with a good set of speakers. 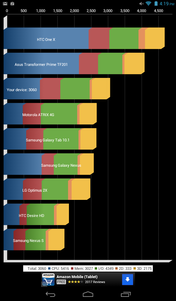 As far as the rest of the package is concerned, the list of necessary compromises is quite long: the display resolution of 1024 x 600 pixels is simply sub-par, the viewing angle stability inferior to IPS displays, and the performance of the tablet is far from outstanding. A rear-facing camera might not be on everybody's must-have list, but we wish that the front facing camera offered better quality. The GPS module has a hard time with getting a lock on Satellites, and the WLAN modules struggles with larger distances between it and the router. On the positive side, the battery life is adequate, and the display brightness high enough to allow venturing outside without major restrictions. A very good alternative at this time is the Asus MeMo Pad HD 7, which is selling for just around $150 and offers a HD IPS display, dual cameras, and better performance. 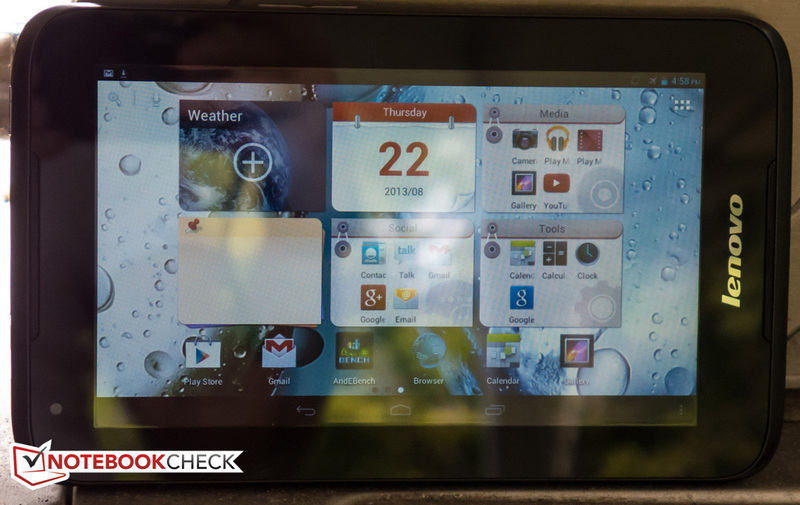 Users interested in a tablet with top-notch display as well as performance should take a look at the new Google Nexus 7. The matte black back is surprisingly sturdy. 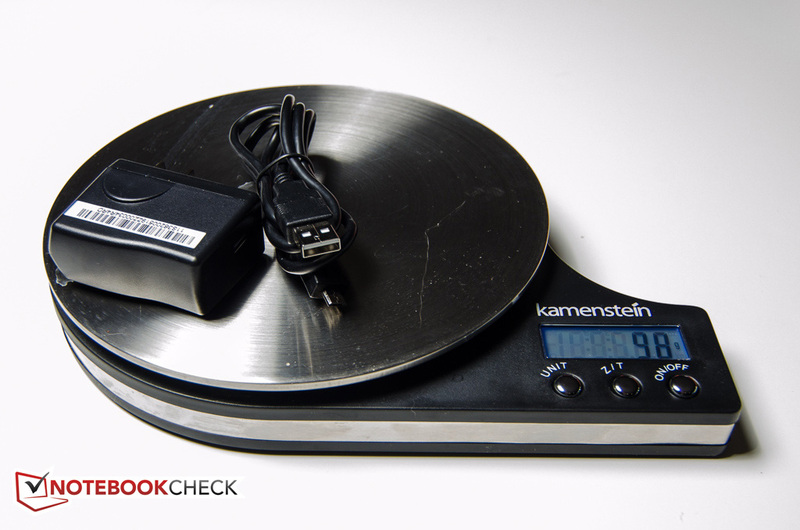 ...looks like it could hold a lot more than what's included: tablet, power adapter, and USB cable. 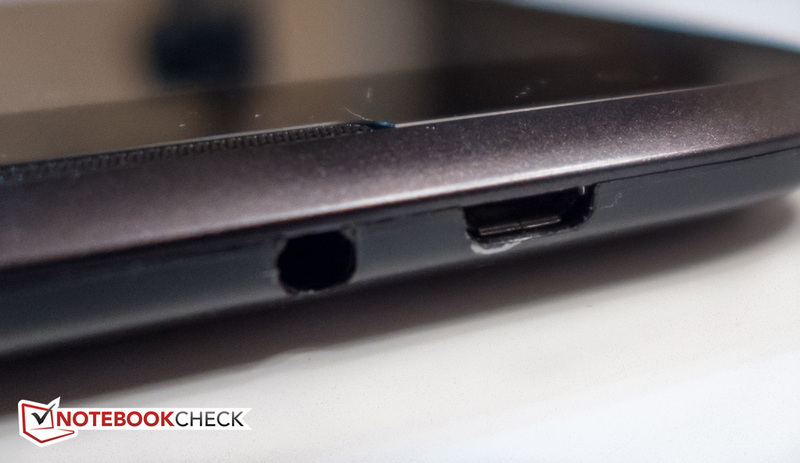 ...there's an microSD card slot on the right side. Unfortunately, the little protective flap is hard to close. The flap on the other side covers a non-existing (SIM card?) slot. 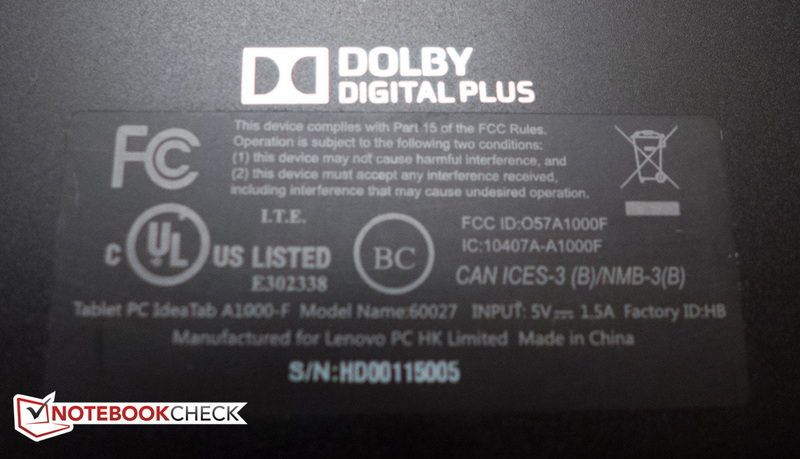 The back proudly proclaims "Dolby Digital Plus"
Two speakers up front (here the bottom one) provide decent sound. The top: micro USB, headphone jack, and power button. 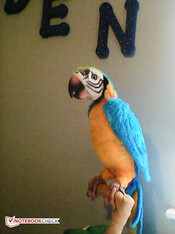 - Colors are not very vivid. 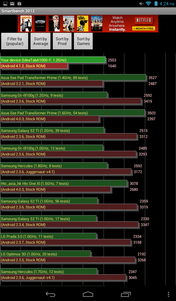 The acceptable build quality and the bright display. A higher display resolution is on top of our list. A better webcam would also be nice. 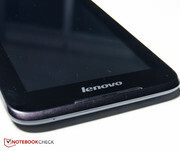 Lenovo builds an overall decent low-priced tablet - but hampers it with a low resolution display. 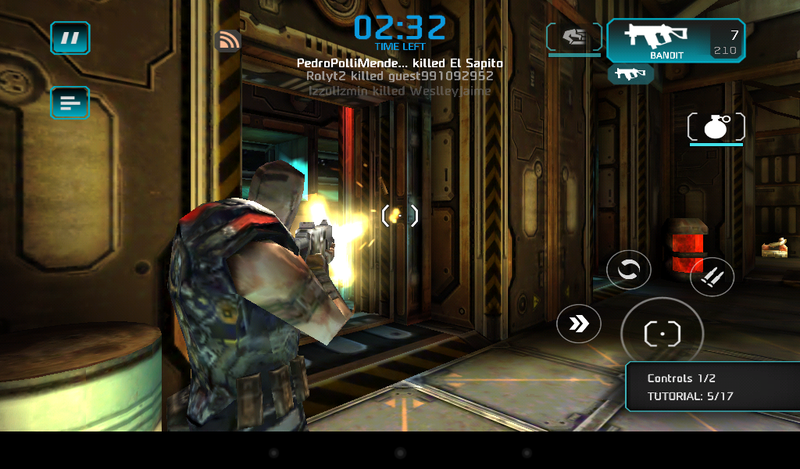 Google Nexus 7 2013, old Google Nexus 7, Amazon Kindle Fire HD, Samsung Galaxy Tab 3 7.0, or Asus MeMo Pad HD 7. The Apple iPAD Mini, if money is no object.